Stupid question: Would it be able to do non-microtonal stuff as well for more 'normal' use? This was a feature I've been hoping to implement in my designs. For all the blue sky thinking of "West Coast" Don Buchla, Serge, Wiard, etc. None of them has left 12tET. (No, unquantized does not mean microtonal). I found a more "hacky" way to get non 12-tET intervals, as I don't have the talent/resources to do a full featured implementation with a PIC like this. But, all credit to you, this sounds *amazing* ! Practically, you should think about creating a PCB that was format independent (i.e. +/12 or +/-15V operation), multiple faceplates for euro/frac/5U etc. As personally I don't think that many modular users will be climbing over each other to use microtones. Another thing worth thinking about is the (in)accuracy inherent in many VCOs, e.g. the 1% (or greater) losses through common 1k/100k output/input impedences, passive tempcos, and temperature variance in Zener diodes or OTAs in VCO cores. All of these may mean that some analogue designs are simply unsuitable for very intricate microtonal programming. Yes, and I'm not the only one. - Includes a scale editor: Create your own custom scales without needing an external computer. I've developed a MIDI-CV-Arpeggiator module that allows arbitrary microtonal scales (in addition to the standard 12TET). The basic idea is that you individually tune each of the 'semitones' in the 5 octave range, and the module will interpolate between each of the notes using either a linear or exponential curve (you can choose which one). Normally you would keep the module in 1v/oct or Hz/volt mode (12TET), but you can switch between the 'normal' tuning curves and the custom one via the front panel of the module. I'm very much interested in such a module. Thanks a lot for your opinions and suggestions. One further question: How many CV channels would you need? 1,2,4? You could always chain multiple modules for more channels. Obviously the price would increase the more channels are included..
for me, only one channel. sounds very interesting indeed! have a look at what Jeff Snyder is doing with his upcoming MantaMate module. it's focussed on the Manta, but will (i think) work as a usb host for all kinds of controllers and will have extensive microtonal functions. he sent me some more details in a private message - i'll check to see if it's OK if i post here. www.snyderphonics.com has very little info, but i think there's a bit more on his fb page. I'd suggest 1 or at most 2 channels. I second the recommendation of making a format-agnostic design. since my brain thinks in intervals, not chords, I'm most interested in a 2 channel device. I certainly hear the skepticism regarding OSC accuracy. But I'd love to find out for myself how 'bad' my oscs are. It'd be nice if such a module came with a few default scales to start off. Say TTET, Just, Pythagorean etc just as plain vanilla benchmarks and maybe a few non-twelve tone scales to give entry into microtonalism. I'm thinking if they were based on Harry Partch or Wendy Carlos' work that could help generate interest. Re-reading the original post reminded me that the module has its own scale editing built in. I'm curious how that will be implemented. 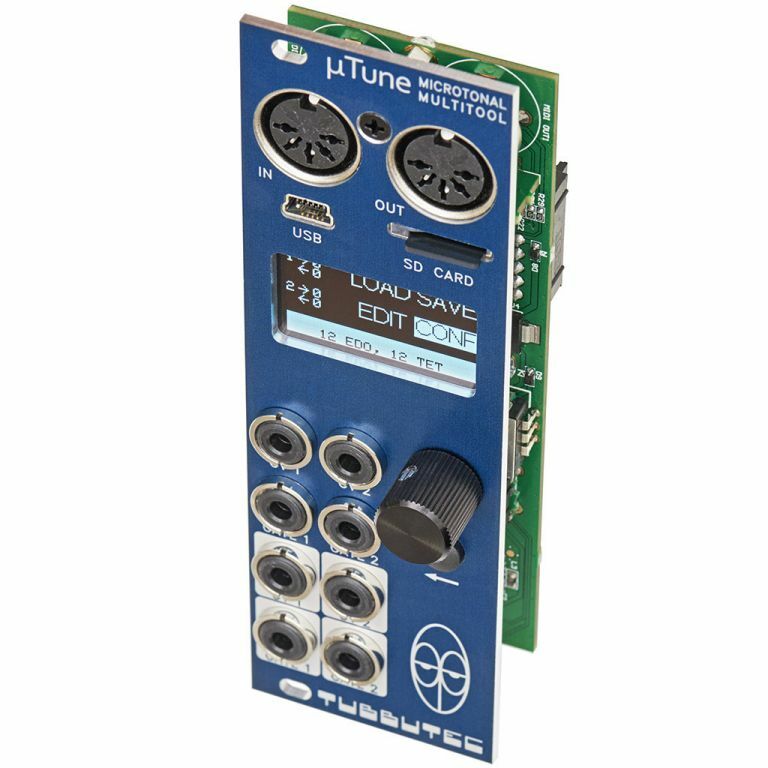 If the module is big or complex enough (in terms of buttons and screen), it might be worth thinking about more than 2 channels of output. Alternatively, I can imagine a simple version that just reads Scala files from SD card and does 1 or perhaps 2 channels of CV. Partch and Carlos are the biggest nutters out there for tuning! They developed their own tuning systems after lifetimes of research, and anything short of mastery is not enough to find the beauty in the beast. But, I agree with the sentiment. A good bank would be a necessity for those of us just getting started. Although, putting in some presets will be by far the easiest task in the design process. Again to the OP, congrats! I've been waiting for something like this for a long time. Of course they were, but for a lot of folks that are just getting into alternate tuning/microtonic scales those are recognizable names. I was actually going to go look up something more reasonable, like a Balinese metalophone microtonal scale, or something from the East Indian quarter tone musical tradition. But in modular circles Partch and Carlos probably have more name recognition. Besides, there are thousands of East Indian quarter tone scales, and the same I believe can be said for gamelans, with scales being similar, but differing from village to village. So again you might end up with dozens or hundreds of scales just to be definitive. Those two could probably be micro SD cards unto themselves! I gotta say after experimenting with some look up tables I calculated and a voltmeter, nah I'm all for a quantizer that does the heavy lifting. Now working on this module, it will have two channels and be chainable to add more channels if needed. Re-reading the original post reminded me that the module has its own scale editing built in. I'm curious how that will be implemented. There will be a small screen, a rotary encoder and button. At the moment, there is only a very rough sketch of how it will look like, but will keep you updated as I am developing..
great! I think two channels are a wise decision so we can - as calaveras pointed out - have instant intervals. I look forward for next year to have a good tuning solution in a module. The other approaches with MIDI/pitchbend or VCO sync are too limiting. I realy do think this is a piece of the modular puzzle that has been missing. with the Scala application and this future module you should theoretically be able to have any tuning you want with as many notes per octave you want. For those who don't know, there's an app for iOS called 'Wilsonic'.